Y'all. I have a new addiction. And it's not a TV show. 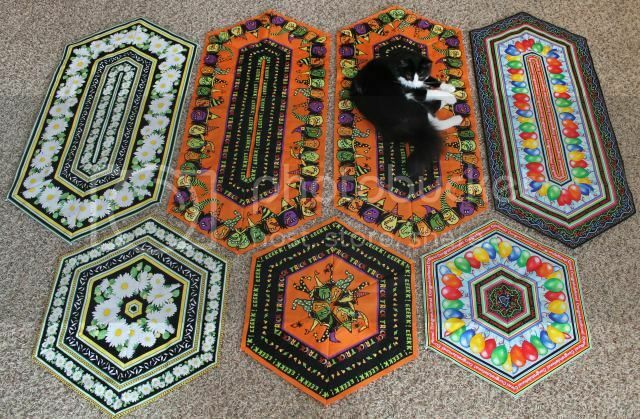 I took a class on these striped table runners, because my mom bought the witch fabric a while ago and asked for one. I bought the pattern in Oklahoma, but finally committed to the class here, because I wanted someone to hold my hand for the first few cuts. They are so easy, once someone holds your hand through the first few cuts! 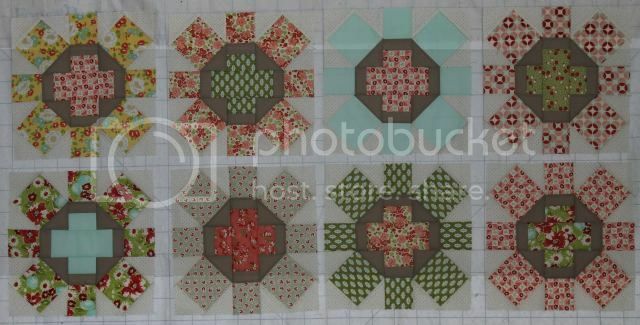 A yard and a half yields two long runners and one hexagon one, with only a little bit of excess fabric. I may have a problem. But at least it's a quick project! Reverse Hearts top - ready to quilt! I feathered all the blocks of Chunky Log Cabin, but ran out of time before I got to the borders. Back on Wednesday this week. 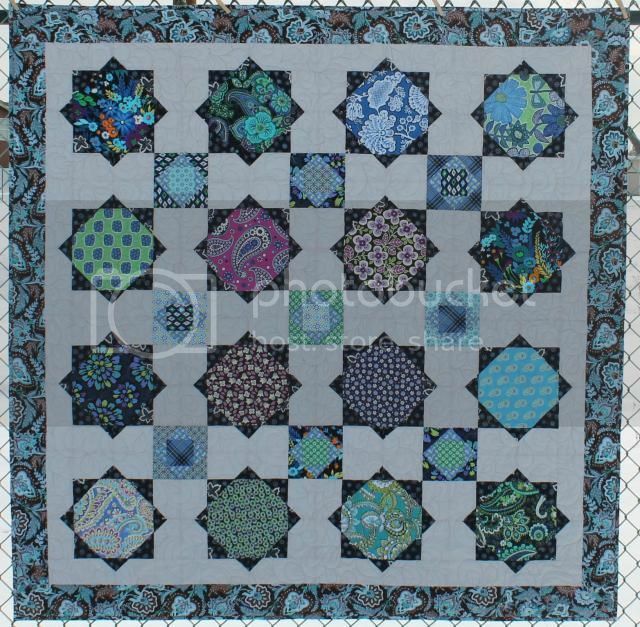 I have been picking out the quilting in Skorca for a while now. 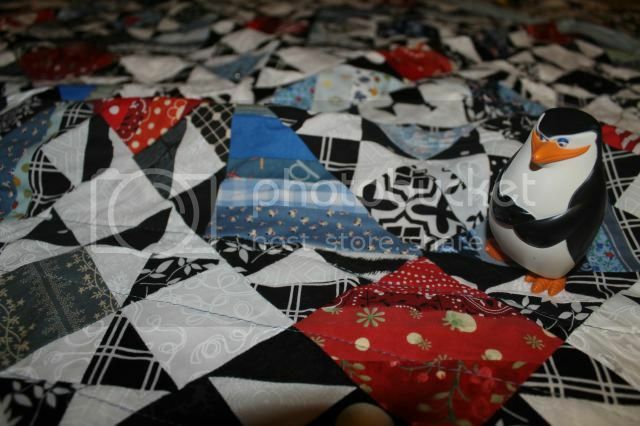 I originally quilted it at home with my walking foot, and it was terrible. Not in an "oh, I think it's terrible but it's really kind of okay" - really, terrible. It was well pinned, but see that bubble behind Skipper? 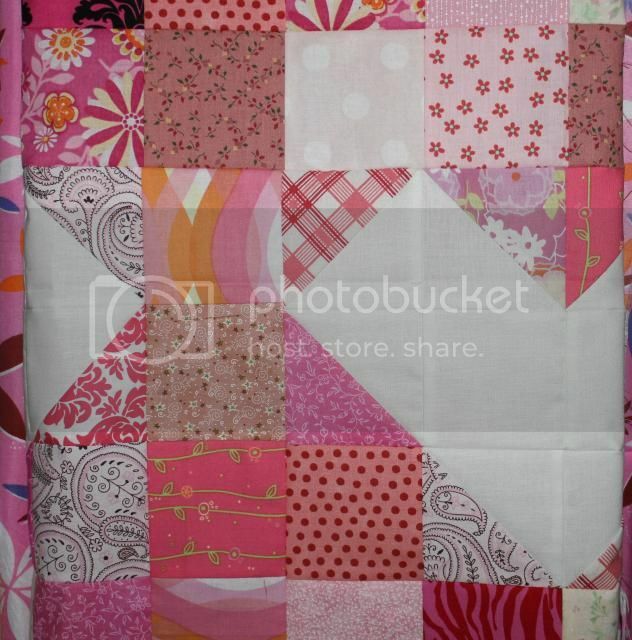 The quilt kept shifting and stretching over and over with each line, and it kept getting worse. My stitches were awful - I'd hit a massive seam and stop, then have large jumps when the walking foot finally made it through. There's puckers all over the back. I made it about halfway across the top and quit last year out of frustration. 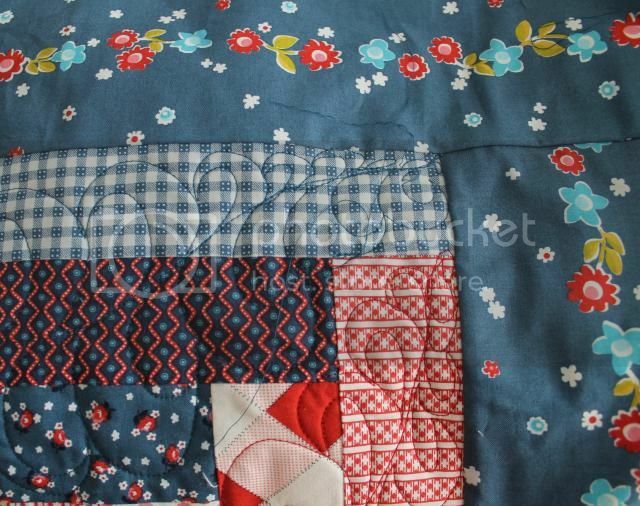 I honestly think Bonnie Hunter's patterns can't be quilted at home with a walking foot - there's just too many seams and bias edges. Enter the long arm late last year, and suddenly Skorca is a viable project again. I'm down to one episode of Downton Abbey of stitch picking to go, and the plan is to get it quilted and bound for the Dude's birthday. Only two years late! 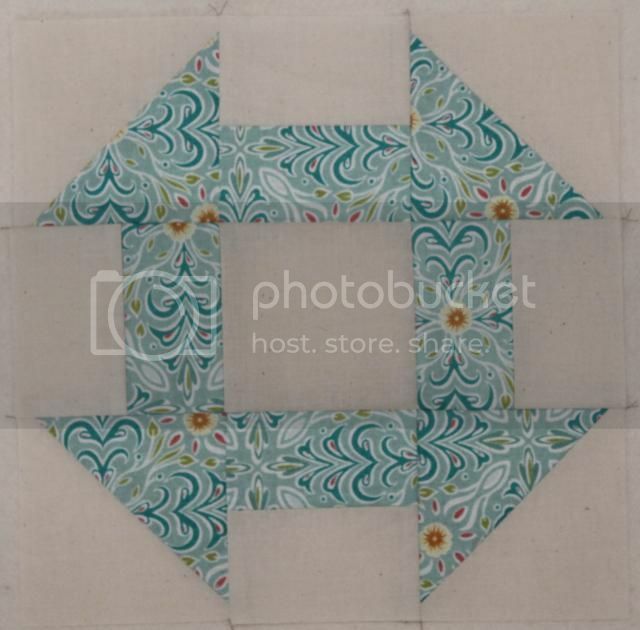 Weekly Churn Dash - the border from Flirt, because I love Flirt so very much and I would make every churn dash this month from it if it hadn't been a jelly roll. Spin Cycle is moving along well. Once all the square-in-square blocks are done, each block goes together quickly. 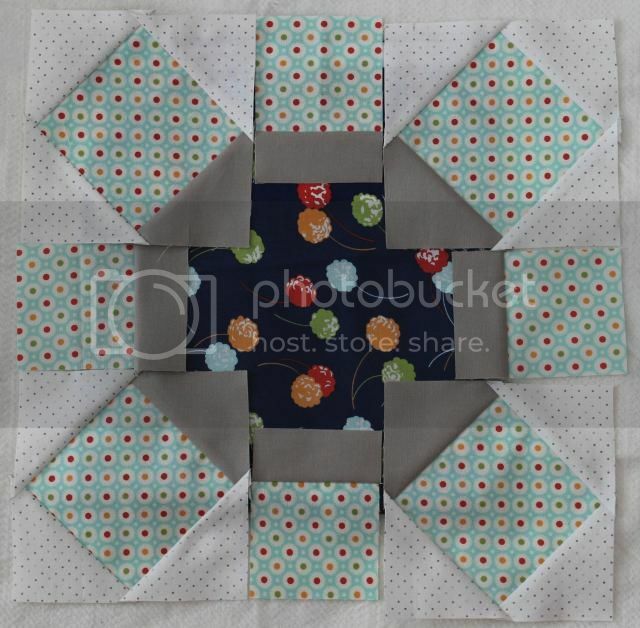 I'm debating using the dark blue from Happy Go Lucky. I like it...but I think it's way out of the color scheme, and would be distracting. I don't need it - I have plenty of fabric to finish without it - but...I really love those puff balls! Thoughts?